Barranquilla, Colombia (CNN) -- She pouts her collagen-filled lips and totters on golden stilettos as she parades down the catwalk. Camera flashes pop in the shaky video recording of the photo shoot. Colombian model Angie Sanclemente is an object of desire. But that was 10 years ago. Now Sanclemente is one of South America's "most wanted." The fallen beauty is on the run; Interpol has issued an international arrest warrant for her. The woman whose ambition took her from poverty to a life of glamour is thought to be in Argentina. Authorities there suspect she may be the "queen pin" of an international operation that uses models as drug mules to move suitcases loaded with cocaine out of Buenos Aires airport. "I am convinced Sanclemente is heavily involved in drug trafficking but I still cannot determine exactly what role she plays," one Argentine source close to the investigation tells CNN. Six people, four men and two women, have so far been detained. Among them a 21-year-old named only as "Maria", who was arrested at Buenos Aires airport in December as she tried to board a flight bound for Cancun, Mexico with 55 kg (120 pounds) of cocaine. That could be worth more than $3.3 million once sold on the streets of the United States or Europe, according to estimates from the U.S. Drug Enforcement Administration. Sources say some of those arrested have named Sanclemente and her Argentine male model boyfriend, now in custody, as the ringleaders of the trafficking ring. Despite an international manhunt Sanclemente, now 30, has continued to update her Facebook page. In a Facebook message to CNN this week Sanclemente denied any involvement in the case, writing: "I'm very sad and hurt by the bad information. I don't know how the press can destroy an innocent person." Later she wrote: "I don't want to go to jail I don't deserve it. I am innocent." She said she had hired a Buenos Aires-based attorney and hoped to clarify her legal situation soon. The lawyer, Guillermo Tiscornia, said he was hired by Sanclemente's mother and that he has not yet had any contact with Sanclemente, who he believes is in Argentina. Tiscornia told CNN he has filed an appeal with the Argentine Appeals Court asking that Sanclemente be allowed to testify without the risk of going to prison if she appears in court. He said: "Angela is afraid to go to prison in Argentina. She is a beautiful woman and she is afraid that she will be raped in prison. She could suffer serious physical and psychological damage." Former boyfriend, DJ Ludwing Hernandez says he has also had word from Sanclemente since the scandal broke. He lives in Barranquilla, the Colombian port city famous for its carnival and as hometown of pop star Shakira. Sanclemente spent her teenage years there. "I heard from Angie through another friend," he said. "Right now she's shocked and scared she will get arrested. She's also afraid for her life because this is a big drug problem and the bad guys could harm her." A Colombian drug trafficker consulted by CNN, who requested not to be named because he continues smuggling, said Sanclemente may be lying low in Argentina. But he said if she had the right connections she could make it back to Colombia. Sanclemente's mother, Yaneth Valencia, rents a $75-a-month apartment on the outskirts of Barranquilla. Neighbors said she left about two weeks ago -- shortly after the international arrest warrant was issued for her daughter -- and Tiscornia said she was now in Argentina. "She didn't have a bed only a mattress on the floor. That's hardly the lifestyle of a drug trafficker's mother," said one neighbor, who gave her name only as Dolly. Sanclemente first hit the headlines in 2000 when she was 20. She won Colombia's prestigious Queen of Coffee beauty pageant. Victory was short-lived. Judges dethroned after just two days when they found out she had been married, contrary to competition rules. That marriage lasted just three months back in 1998 to a Barranquilla businessman. He paid for her to study journalism at Barranquilla's university. A university friend, who did not want to be named for fear of reprisals, said Sanclemente dropped out of college after three semesters and spent tuition fees on silicone breast implants instead. That friend said Sanclemente idolized Colombia's then top model Natalia Paris. She even dyed her hair blonde and imitated Paris' distinctive accent to appear more like her. Paris married a drug trafficker turned DEA informant, known as Julio Correa. He was killed in 2001 by his former associates when he returned to Colombia from Miami. Drug underworld sources say he was cut up in a meat grinder. While some who have known her doubt she is capable of run a drug smuggling ring, others describe Sanclemente as ambitious and determined from an early age. "Angie was very analytical. She calculated and weighed things up. She took firm steps so she didn't make mistakes," said Luis Alfonso Posso, one of her teenage friends. Sanclemente was an only child. Her mother -- a single mom - scraped a living selling shoes and clothes. But she saved enough to enroll Sanclemente in Barranquilla's top modeling school, "La Pasarella." Instructor Nury Rodriguez remembers the young Sanclemente as skinny and lacking self-confidence. But aside from her exotic looks, Rodriguez said she had one outstanding trait -- she hated to lose. "Angie always wanted to win and draw attention to herself one way or another. She wanted to stand out," Rodriguez said. "She once confronted the judges in a beauty contest because she thought she should have been among the finalists." Her brief reign as Miss Coffee Queen also brought her to the attention of admiring drug capos, according to a fashion industry insider who knew Sanclemente in Bogota. "Narcotraffickers go to beauty pageants to buy the women they like. In other cases they sponsor candidates, paying for their outfits, their plastic surgery and even bribing the judges so their girl wins," the woman explained. The woman, who still organizes beauty pageants, did not wish to be named saying she feared a backlash from within the industry. Sanclemente left Colombia around 2005 and headed to Mexico where she continued to pick up modeling assignments and bit-part roles as a TV actress, according to friends. 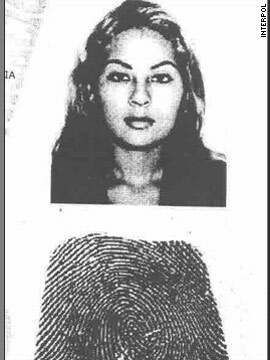 If the Argentine allegations are true, it's unclear how Sanclemente made the leap from drug trafficker's moll to becoming a cocaine queen in her own right. "There are some very determined and very strong women who have got more balls than the men. But usually I would say a girl like that would be running the network of mules not the whole cartel," the drug trafficking source told CNN. The drug trafficker said he was almost certain, if the allegations are true, that Sanclemente was not operating alone. He said she would have needed connections to a Mexican cartel. "Cancun is a very good spot to export drugs to Europe. A lot of tourists arrive on charter flights and the Mexican cartels have done an excellent job infiltrating the police," he said. In the past Sanclemente has dyed her hair blonde then black and was last seen with copper highlights. She used to use blue contact lenses though her eyes are naturally brown. But even if she goes unrecognized, friends say Sanclemente is unlikely to pass completely unnoticed. Her silicone-enhanced curves, tight-fitting outfits and catwalk strut make her hard to ignore. "Angie kicked up dust wherever she went. Men and women would stop and stare whenever she passed," a female friend said.